This was the first Volunteering in Nepal trip since we set up our charitable works program. 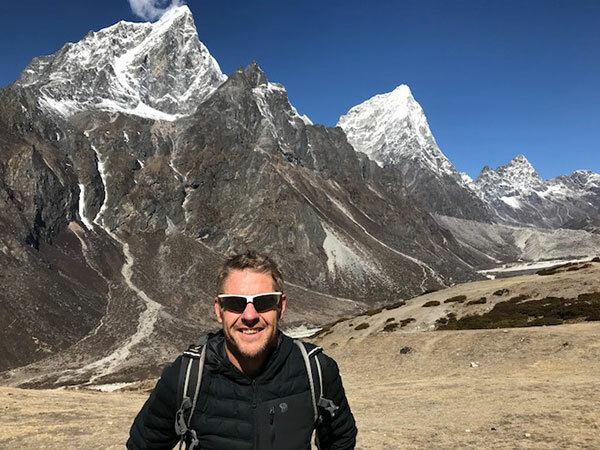 To catch you up – on my last journey to Nepal, I discussed with Matt from Hike Himalaya Adventures how Sport & Spinal Physiotherapy could help the disadvantaged in the remote rural villages of Nepal. You can read about that here. After that trip, we then set about organising ourselves for our first volunteer mission into Nepal. This culminated in launching our Nepal Program in April 2018. 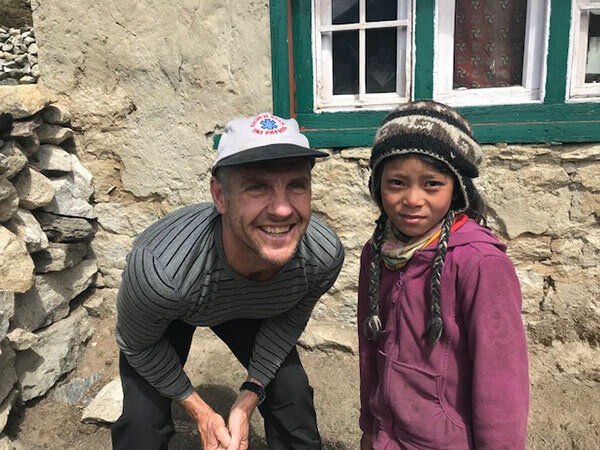 This was a two-part journey with the aim of enjoying the mountains and helping out in the villages. This article refers to our trek into the mountains. So the day started early, waking up at 3am to catch the 4am bus with Murrays to Sydney airport. I was already very tired since I had only slept about 3 hours from packing very late into the evening. Once on the bus it was nice to doze and finally relax. 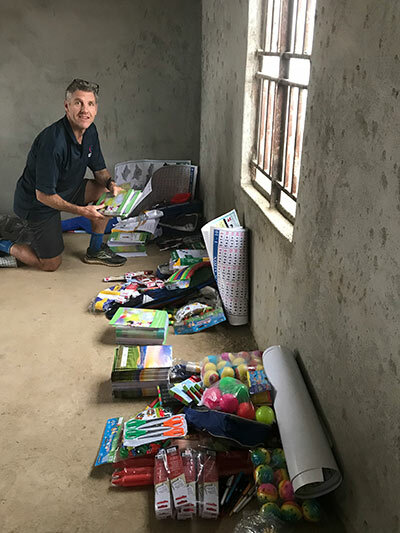 Murrays were great and I would like to thank them again for waving the excess baggage limit to allow me to take my own personal belongings as well as the 6 donation boxes that our generous clients had contributed for the villages around Maidi, Nepal. Again, for those just catching up, we put a call out to all our clients for donations for our Volunteering in Nepal program early this year. Our community didn’t disappoint and in fact we were overwhelmed with the response. We ended up with lots of clothes, jackets, shirts, dresses, books, blankets and some sporting equipment. We had a lot of stuff and Murrays were very helpful in helping me load and unload all our bags and boxes. 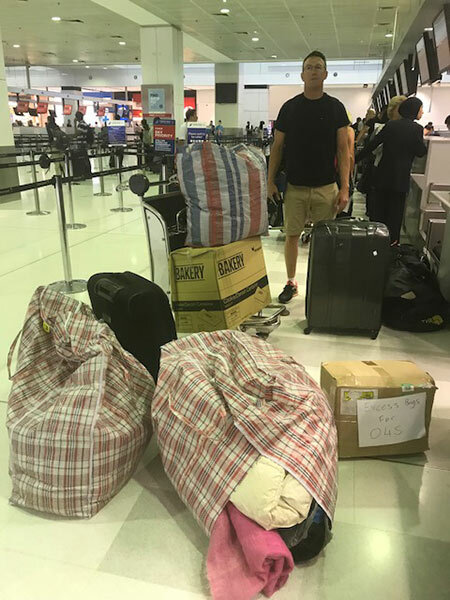 We were taking a risk taking all the donations to the airport as we had failed to receive confirmation from Southern China Airlines, despite numerous emails and phone calls, requesting that they waive the excess baggage limit. So we simply printed out the emails that we had sent and hoped that at check-in we would have someone with some common sense and moral fibre to see the good work that we were going to be doing and waive the fee. Perhaps I am naive, but sadly, this was not to be. We were able to get about 2/3 of our donations on board, but for the rest, Southern China airlines wanted to charge us close to $4000. We could not afford this exorbitant fee, and it would have blown the budget for future Sport & Spinal Physio sponsored projects to go ahead. So we simply left some of the heavier items like books with airport officials and trusted that they would make their way to local charities. I pledged to make up the difference we lost in donations by purchasing books and sporting equipment in Kathmandu. 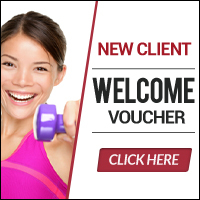 I donated $500AUS on behalf of those generous clients who gave some books, learning aids and sporting equipment. I can vouch that your $500AUS more than made up for your donations, plus as an added bonus, we supported local business. Our Volunteering in Nepal mission was back on track. What to Learn From Our Check-in? Rather than look at the negatives, I sort out positives from the experience. Although the airline left a bitter taste in my mouth, I was hopeful that our clients’ donations that did not make it onto the plane, would make their way to local charities. I was more than pleased how far the $500AUS went in purchasing books, toys, times table charts and sporting equipment. I was also pleased that we could buy from local retailers in Kathmandu, thus helping the Nepalese economy. For future trips, we would have to find other avenues to bring over donations. 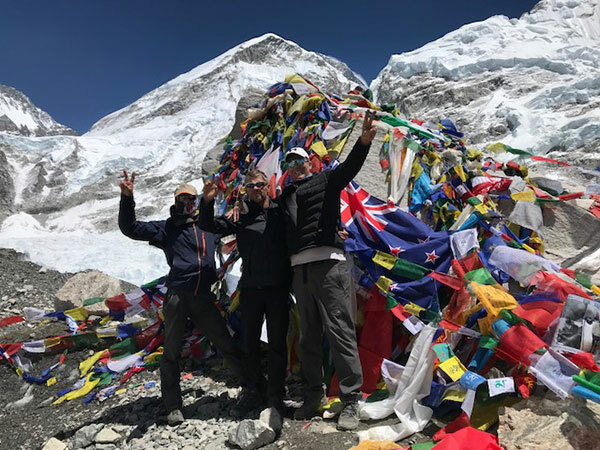 Thanks to the superb effort from our guiding company, Hike Himalaya Adventures, my friend Marty (deputy principal at Masada College, Sydney) and I had a great time. 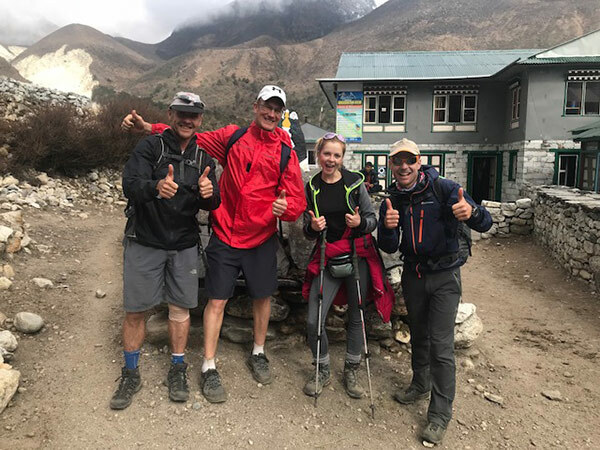 Although the trip was not without its challenges, our guide, Depak, with help from Matt (Hike Himalaya Adventures) made sure our trip was fun and safe. Day 01: 13 th April: Arrive in Kathmandu (1,400 m). Overnight at a Hotel. Day 02: 14th April: Fly to Lukla (2,804 m) in the Everest region and trek to Phakding (2,610 m) – 3 hours. Overnight at a Guesthouse. Day 03: 15th April: Trek to Namche Bazaar (3,441 m) – 5.5 hours. Overnight at Guesthouse. Day 04: 16th April: Namche Bazaar Acclimatization Day. Side trek to Everest view point. Overnight at a Guesthouse. Day 05: 17th April: Trek to Tengboche (3,860 m) – 5 hours. Overnight at a Guesthouse. Day 06: 18th April: Trek to Dingboche (4,350 m) – 5 hours. Overnight at a Guesthouse. Day 07: 19th April: Trek to Lobuche (4,910 m) – 7 hours. Overnight at a Guesthouse. Day 08: 20th April: Trek to Everest Base Camp (5,365 m) and Kala Patthar & walk to Gorak Shep (5,180 m) – 9 hours. Overnight at a Guesthouse. Day 09: 21st April: Trek to Lobuche (5,300 m) – 7 hours. Overnight at Guesthouse. Day 10: 22nd April: Trek to Thukla (4,620 m) – 5 hours. Day 11: 23rd April: Trek to Tengboche (3,860 m) – 6 hours. Day 12: 24th April: Trek to Namche Bazaar (3,441 m) – 5 hours. Overnight at a Guesthouse. Day 13: 25th April: Trek to Lukla (2,804 m) – 6 hours. Overnight at a Guesthouse. Day 14: 26th April: Morning Flight from Lukla to Kathmandu. Overnight at a Hotel. Day 15 – 21: 27th April – 2nd May: Maidi village physio work. In hindsight, the schedule was a bit rushed with little down time, but my friend, Marty was limited by the school holidays and had to get back by Day 1 of Term 2. So the program was what it had to be. Overall the trekking is not too difficult but the altitude, cold and food make the trek challenging. For me, I had my ups and downs. On day 2, I unfortunately sprained my ankle on the cobblestone path. Luckily, I had some rigid strapping tape with me, so I dutifully taped my ankle up and was pretty much inclined to do this for the rest of the trek. 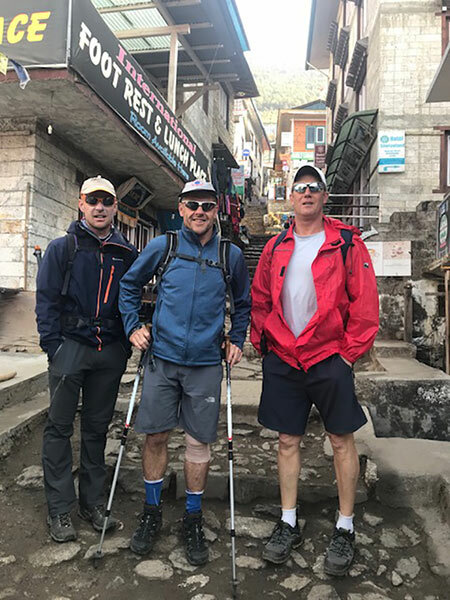 This also meant doing my ankle exercises (along with my knee exercises) each day to make sure I stayed fit to keep on trekking. The ankle slowed me down a bit, especially in the first few days as I limped about. 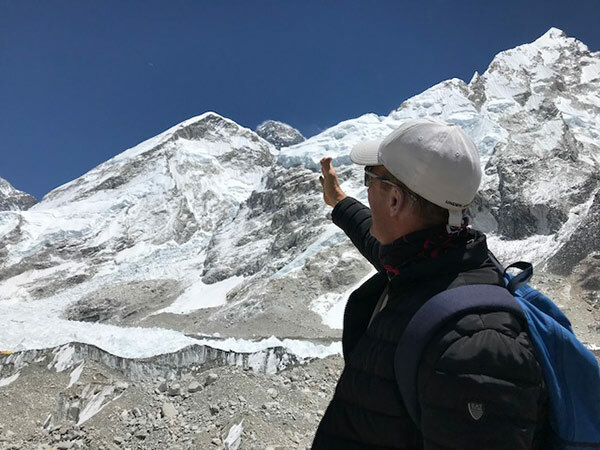 But by the time I reached the higher elevations close to Everest Base Camp, my ankle was feeling pretty good. For all our clients, this just goes to show that doing your exercises early on after injury certainly speeds up your recovery. On day 4, I started feeling unwell and was struggling with a sore throat and a sniffly nose. I did what I had to do, but I was feeling lethargic. I managed to push on. 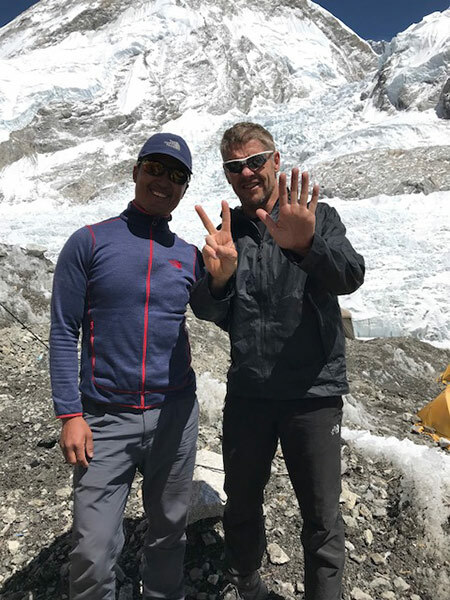 By day 8, I was feeling strong again trekking to Everest Base Camp. I seemed to be handling the altitude at close to 5000m and my ankle felt strong and I seemed to have recovered from my sore throat illness. The views were amazing and you felt so small and insignificant against those high mountains. Enough said, I’ll let the photos do the talking. 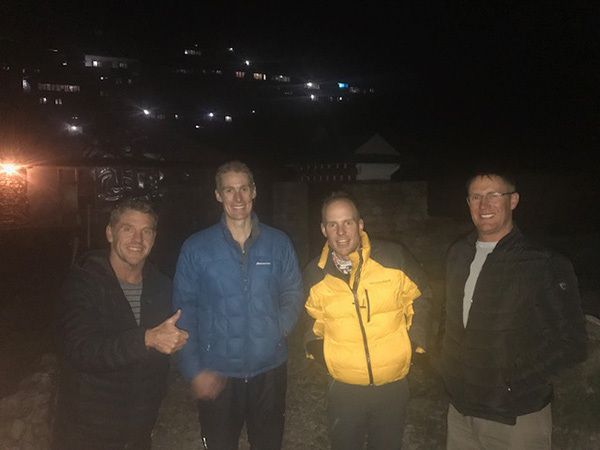 Then on the night of day 8 at a guesthouse at Gorak Shep (5180m), I ate something that involved hash browns, cheese and eggs. As soon as I started eating it, I knew I had made a mistake. By that night I was vomiting, had severe stomach pains and diarrhea. The next day we hiked up to Lobuche high camp (5300m) for a hiking challenge and to get a closer look at the mountains. By the end of the day I seemed to be recovering from my food poisoning bout and was feeling bright and enthusiastic for the next day. Dinner went down well. However that night, things went from worse to dangerous. I could not sleep and started vomiting again, felt light headed and had severe chest pain. I could not walk straight and was in the midst of a bad case of altitude sickness. My symptoms were worsening and my guide Depak decided we needed to descend and fast. It was 3am. We packed quickly and with head torches on, descended down to Thukla (4620m). Once there, we awaited for a helicopter ride to Kathmandu hospital. It was funny but by this stage, I was actually feeling quite well. In fact, I felt like a bit of a fraud, even though I was still wobbly on my feet. Even after descending for half an hour, I had started to feel well. Such is altitude sickness. Nevertheless, our guide insisted that I was still too unwell and that I should still catch the helicopter back, just to be safe. Even though I had never been on a helicopter previously, I can’t remember much of the flight because I was asleep for most of it. Once back at the hospital, I was given a drip for severe dehydration and hospitalised overnight for observation due to cerebral oedema (swelling on the brain). This would explain my ataxic gait, walking around a bit like a drunk. Anyway, a good night’s sleep, or rather sleeping for 18 hours, helped significantly and I was duly discharged the next day. It would take another 3 days before I felt recovered and could walk without any wobbles. Peter Budd, Australian Ambassador to Nepal – found out from Peter that he was on hs 5th posting including one to Baghdad. Bryony has met some inspiring women who are pushing the boundaries and showing girls that #anythingispossible. 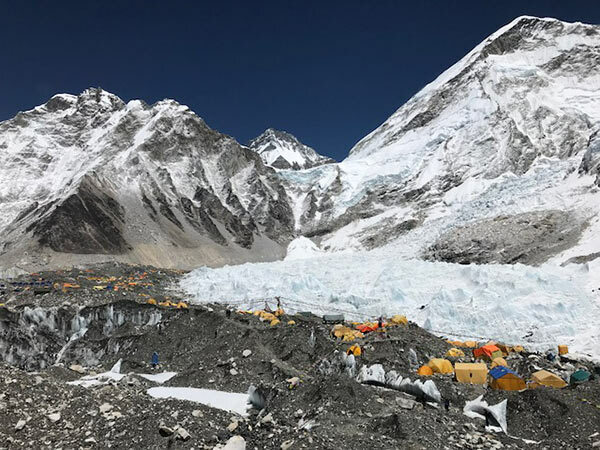 On her recent trip to Everest Base Camp she had a cup of tea with Great Britain Olympic gold medallist Victoria Pendleton who was attempting to summit Everest. Victoria talked about how we should embrace our fears and just give things a go. See the interview with Victoria. Will I Go Back to Nepal? So one might ask, would I do it again? 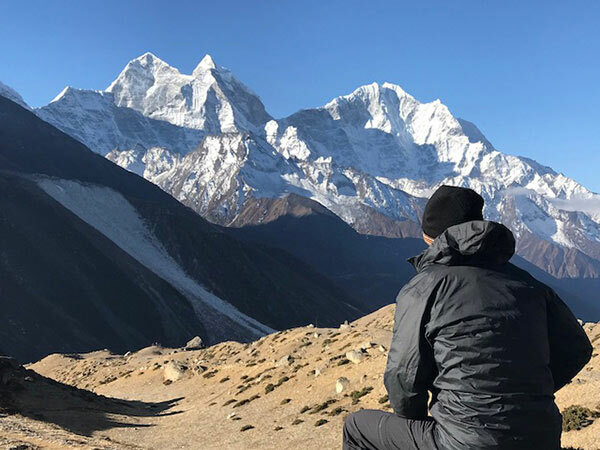 Whilst I pondered the question myself in the mountains and the challenges that I faced, I soon dreamt of those mountains quickly again once I had reached back at Kathmandu. As Matt Eakin from Hike Himalya Adventures mentioned to me “the mountains will always be there”.